As a pipeline TD you might need to setup task status auto updates in Shotgun. It isn’t as simple as it may sound, because Shotgun, out of the box, doesn’t provide this functionality. However, it can be done with Shotgun Event Daemon and some scripting. So, first off, a bit of background. As a pipeline guy, automation is essential. You need processes to work automatically, ideally in context and further more in a certain order. That happens all the time. Shotgun, and many other tools, provides a great backend for such automation, however, Shotgun itself doesn’t provide too much automation for its own tasks, versioning, events in general. Shotgun API 3.0.15 and duberPython, all OK! I updated my Shotgun wrapper for duberPython yesterday to support the latest and greatest Shotgun API ver. 3.0.15.dev. All seems to be working pretty well, without any issues. I added all the methods available by the API to my MAXScript wrapper, so that everything is fully accessible, through duberPython, from inside 3ds Max! I will be releasing this wrapper to the public real soon, so stay tuned! duberPython is available for download! That’s right! duberPython is finally ready for it’s debut public release. But that doesn’t mean it’s a fresh newb of a plugin. 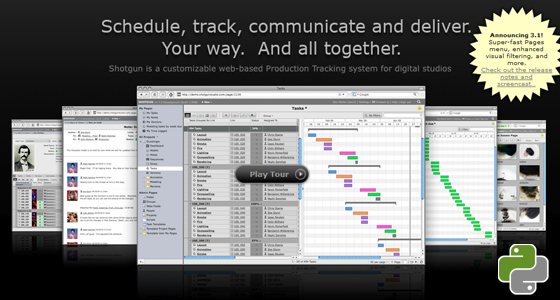 It has been used in high-end productions at studios such as Pixomondo or Orbit, etc. on feature films, commercials, full CG animations, etc. duberPython came into life after a long search for a solution that’d allow us at duber studio have 3ds Max communicate and play nicely with other pipeline tools and DCC applications. 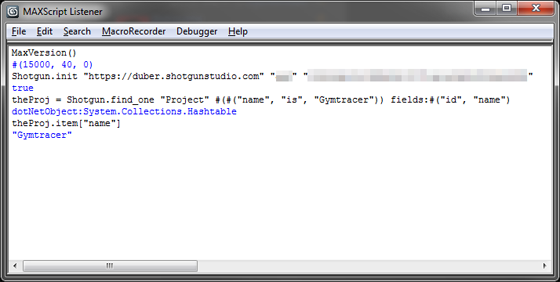 duberPython was designed, mainly, to bridge 3ds Max and Shotgun (JSON API is fully supported!) and Tactic. I even wrote a dedicated Shotgun wrapper, so that you can call Shotgun methods directly from within MAXScript (available upon request), so that writing your studio pipeline tools is really, really easy and fun. The current version runs on the IronPython engine 2.7.3 and is compatible and has been thoroughly tested with CPython 2.7.3 (though, compiled Python modules are not accessible via IronPython). Currently you can directly call Python code (via string parsing) from within MAXScript, or you can call Python scripts externally and pass it any number of variables for Python processing. The variables will get automatically translated to and from Python, so that strings are strings, booleans are booleans, arrays are arrays, etc. Even dictionary data types are supported in MAXScript (via Hastable dotNET objects)! So, do not hesitate, head over to python.duber.cz and give your full-featured 30day trial a go and if you find it useful, I’d be very happy if you purchase the full version for only $25 bucks, which is a bargain for what you get! (site licenses are available upon request). Shotgun is $49 bucks per month! I was shocked and very pleased to hear that Shotgun Software decided to unify their pricing and bring it down to $49 USD per month per user with the API! How awesome is that?! That brings me to a thought of actually releasing our duberPython plugin for a ridiculously low price so that EVERYONE can use Shotgun and our Python module in their pipeline! Let me know what you think, guys and I’ll prep the installations in the meantime. 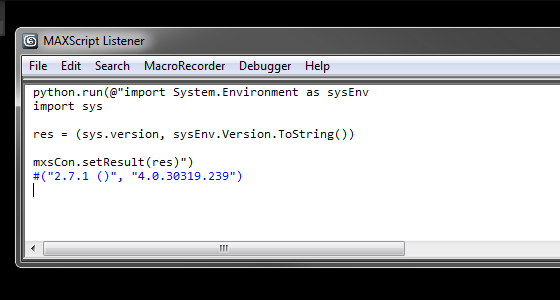 Just a shout out to those who downloaded my RV Explorer integration Python script. I’ve updated it so that RV now accepts file sequences with various leading zero lengths as I bumped into this issue myself recently. Hope I haven’t caused you too much trouble. Ever since I read this blog post on the Area, I was intrigued to get this working in an IronPython environment (that’s pretty much all I know, in the “serious programming” area). Unfortunately for me, the article mentions C++, OLE and COM. Which are my least favourite technical subjects. So, now when I finally really needed this solution (more on that some time later), I had to ask on the Autodesk forums. Luckily I got an answer. But first off, huge thank you goes to Larry Minton, an Autodesk Engineer, without whom I wouldn’t have been able to get this thing going. Now, about the problem. If your facility has a render farm and you happen to work off of your local storage, you have to point your assets to a UNC path where they’re stored so that all the machines on the network can find and load them when rendering. There are many ways of doing this and usually your pipeline TDs had figured this one out prior you even starting any work on the project. Unfortunately for me, I’m the only pipeline TD here. 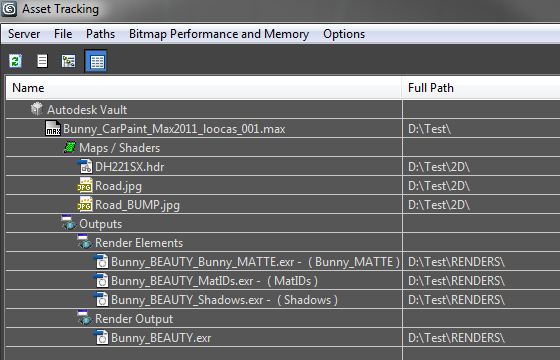 So I had to figure out a way of re-pathing my assets in 3ds Max scene files prior to rendering.